The objective of a Stumpery is to create a garden feature from ferns, logs and old tree roots. The Victorians started a trend to build Rooteries, Ferneries and Stumperies as romantic woodland places to grow exotic ferns and woodland plants. If you have a dark corner or want to collect ferns then you could start your own Stumpery quite easily and add to it as the fancy takes you. Old trees are the basic raw material. If you live in or near the countryside finding logs and tree stumps should be relatively easy. In a suburban gardens a few pieces of trunk from felled sycamore can form the basis for a mini-stumpery. Different wild life to that found in tidy gardens love stumperies. Fungus can thrive on decaying wood and moist conditions. Ferns should be planted in spaces between stumps and roots. They like dark places without fertiliser but some leaf mold can be added to the soil. Chose a variety of ferns for shape, size and colour. Dyopterarias erythrosora has elegant fronds that emerge bright orange and change to lime-green as they age. Athyriums like the Japanese painted fern (niponicum pictum,) and Lady fern are smaller but can light up very dark places. Adiantum pedatum is a small maidenhair fern with a fragile appearance but a hardy nature. It has a running rootstock that quickly makes a respectable clump. Snowdrops, celandines,primroses and foxgloves may grow well in semi shaded areas or on the edge of the Stumpery. 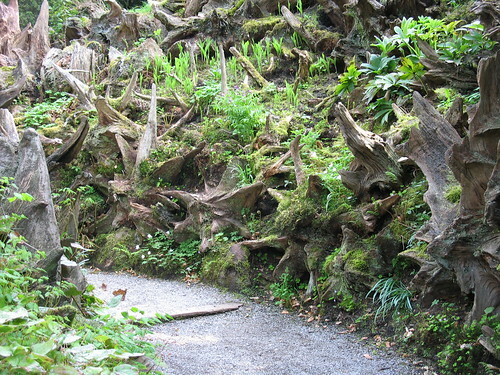 Photograph of Stumpery at Biddulph Grange Garden – Biddulph by westher, on Flickr under creative commons license.